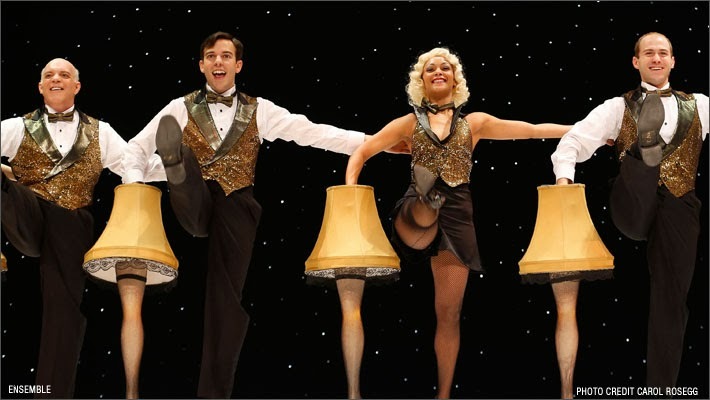 “A Christmas Story-The Musical,” like the holiday season itself, is a heart-felt mix of nostalgia, warmth, good humor, music, color, and spectacle. The creators have succeeded in enhancing and expanding the spirit of the original movie so well that it seems this story has always had a life on stage. The depth of talent in this production cannot be overemphasized as the adult leads originated the roles in New York last season. Dan Lauria, known as the father on “The Wonder Years,” plays narrator Jean Shepherd, upon whose short stories the book is based, with warmth and good cheer. Erin Dilly’s “Mother” sweetly embodies all the disparate elements that parenthood requires. John Bolton as the “Old Man” has 2 standout numbers with “The Genius on Cleveland Street” which shows that Ralphie’s predilection to fantasy is probably inherited. Aided by a kick-line of plastic leg lamps, he gets to express his joy in winning “A Major Award.” As Ralphie’s teacher, Caroline O’Connor brings down the house, ably assisted by the children of the ensemble, as she explains to the lad that “You’ll Shoot Your Eye Out.” Of special note is young Luke Spring, a tap dance prodigy whose solo in that number is a spectacularly pleasant surprise. Most of the original creative team is on board as well, and that consistency is evident in everything from the inventive choreography to the homey, snow globe-evoking set. Whether you’ve ever enjoyed the 24 hour Christmas Eve marathon of the movie or not, this is a highly recommended family show. “The apotheosis of the Dance,” Richard Wagner’s famous description of Beethoven’s Seventh Symphony, is a phrase that could also describe the other two pieces on the second Masterworks concert of the current HSO season. The program opened with Leonard Bernstein’s 1944 ballet "Fancy Free." HSO Music Director Carolyn Kuan made her entrance, turned on a vintage gramophone at stage left, where Billie Holiday sang “Big Stuff,” the prologue Bernstein composed for her, and waited for "Lady Day" to finish before giving her musicians their downbeat. It was a lovely prelude to the HSO’s exuberant performance of this jazzy music. Brass and percussion played their featured parts with gusto, and HSO pianist Margreet Francis earned a solo bow for her dazzling work. Next came a rarely heard piece by a composer seldom played in the concert hall: Astor Piazzolla’s "Four Seasons of Buenos Aires." Reflecting the tango rhythms of his native Argentina, these four pieces (named Summer, Autumn, Winter, and Spring) were arranged by Leonid Desyatnikov after the composer’s death in 1992 into a half-hour-long suite for solo violin and string orchestra. Each movement includes at least one clever quotation from Vivaldi’s Four Seasons. The brilliant soloist was Hartford native Peter Winograd, a Juilliard graduate, member of the American String Quartet, and son of Arthur Winograd, who led the HSO from 1964 to 1985. 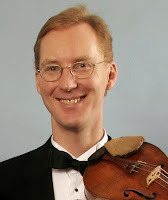 Both soloist and other ensemble members interspersed lyrical playing with entertaining bursts of distorted string sound or percussive effects from knocking on the wood of their instruments. The enthusiastic audience rewarded them with a standing ovation. The female African American acapella group Sweet Honey In The Rock sang a spectacular set with a live jazz trio that they dubbed the Honey Men. The men, Parker McAllister on bass, Jovol Bell on drums/percussion and Stacey Wade on piano/keyboard served as a tasty jazzy side dish to the soulful main course female harmonies. This was a celebration tribute to four out-spoken musical icons: Nina Simone, Odetta, Miriam Makeba and Abbey Lincoln. The evening featured unique African music as in Makeba's South African chant, "Shuka, Shuka (Choo Choo Song)" which sounded like a steam engine. Female harmony and hand claps supplemented Odetta's, "I Can't Afford To Lose My Man." A beautifully sung solo vocal by N. B. Casel on Simone's "If I Should Lose You" was matched by Stacey Wade's earnest piano solo. Aisha Kahlil interpreted Simone's "Feelin' Good" with sign interpreter Shirley Childress doing an outstanding job. Louise Robinson highlighted "Trouble In Mind" with the sweet added Honey Men refrain, "She's Got Trouble In Mind." "Pata Pata" solicited lively audience dance participation that revved up the fun factor. The next theme focused on the Civil Rights movement. Kudos to sound director Art Steele for his creative talents as the girls sang "Oh Freedom," "Ain't Gonna Let Nobody Turn Me 'Round," "I'm On My Way To Freedom Land", and "Glory, Glory Hallelujah." The Abbey Lincoln tribute included "Down Here Below," "The Music Is The Magic" and a spirited "I'm In Love." Robinson rocked Odetta's mind-blowing "God's Gonna Cut You Down" with a powerful message. The performance seemed to flow with music that touched all aspects of life. A jazzy rendition of "Let There Be Peace On Earth" was silky smooth. Sweet Honey closed with a sultry West African Makeba song, "My Love Has Come" which showcased an infectious keyboard solo. The encore, "N' diarabi/Africa Is Where My Heart Lies" was a hand percussion soother with colorful imagery of African skies, valleys, and mountains. “Dying is easy, comedy is hard," an oft repeated quip in the theatrical community. If comedy is hard, then farce is a monumental task indeed. Author Ken Ludwig offers up a nice foundation for some out of control, sidesplitting hysteria that doesn’t quite hit the mark in this production. Greg Trochlil did a very nice job on the set design with functional elements that help bring the castle setting to life. Pace and energy are the key to pulling off a farce of this ilk and, although there were some very funny moments, this performance never quite conveys the obligatory sense of urgency and impending doom consistently. One of the aforementioned funny moments comes at the beginning of Act II with Kevin Bechard as William Gillette and Heath Verrill as Felix Geisel. Theirs is an enjoyable synergy between the two characters and the scene rolls along nicely. In general, the acting is good yet understated, almost as if there was a fear of going over the top. The character of Daria (played by Patricia Colkos) seems to be particularly underplayed. This role is begging for some scenery chewing, which just doesn't happen. Perhaps it can in upcoming performances. This show has the potential to be quite good, the director and cast just need to release the brakes and trust their instincts.